I guess being an electrician by trade, a) it makes it easier for me to understand and b) I run a risk of using some trade shorthand when describing what to do as I think I did but you seem to have got through that! Well Done Mate! Looking forward to more pix of the progress! Hi Paul You have a very fine layout there, is it portable, and are you able to take it to shows??? I must admit, first of all I am not an electrician , and I don’t even know much about blocks on model railways. Have you actually put up a plan? It is a bit hard to work out what block you may or may not need! I read in a couple of other posts that you have trouble reducing your photos etc. If you want to send the entire photo, I can reduce it for you using Thumbs Plus or GIMP that will enable you to upload it! PM me if you want my email! but he overcame the trepidation of the wiring process and made a very creditable job of it! If you are going with DCC, you only have to make your blocks as such that all the track is powered and there are no short circuits caused by electrofrogs. So perhaps a plan would work OK. If you are not using DCC, then the most onerous task you need to undertake is to work out what your operating scheme is likely to be and what you want your trains to be able to do. The blocking will then fall into place! Hi Kevin,I understand that Trevor and myself have mentioned blocks and sections a lot in my thread based on my layout design and current build, however I see that you addressed a question directly to Marty and the discussion is based on your own 'shunting puzzle' ...so would it make sense to start a new topic thread under 'Trackwork & Operation' so that others can learn and help on your questions and layout and find the advice given more easily? I'm sure the admins of this site can help do that for you and also move the last few postings from my Braughing to Standon branch design thread into it too. I have drawn my interpretation of Kevins layout showing a sector plate. I have only used one track of the sector plate as the Programming Track that can be changed to a DCC track. I have a little bit of direct experience with DCC so the diagram was based on a few presumptions. I have drawn insulators in the event that your frogs are electro frogs and need insulated joiners. The sidings are continuously connected. If you use Insul frogs, you can keep the wires but no need to worry about the insulated joiners. DCC engines that are stabled are totally inert so it does not matter which way or where the engines are parked. Programming Tracks need to be isolated so I have used one of the transfer tracks as the part time program track. The DPDT switch determines whether the third track is the programming track or operating part of the layout..
Hi Trevor. I have only just caught up with this thread. I too use Peco streamline track, for my sins? And I discovered that as flat as the baseboard was, the metal fishplate allowed the track to lay flat, but the insulated fishplate put a “Bump” in the track. After lengthy investigations , I have found a thread on the very subject, but it is only suitable from the outset, unless that is you have “loads of money to dedicate to your layout” .The idea is when you lay the track you only use the metal fishplate s, and you create a gap on the frog with 20thou styrene, secure the track and remove the styrene, then fill the gap with “ Milliput “ , when it has set smooth the join. WIth Insulated joiners with the track, you can either remove that sleeper entirely or undercut it so there is an appropriate notch out of the sleeper under the rail. Alternatively you can install a metal joiner at the point/turnout then cut a gap in the rail with a razor saw and super glue an offcut of styrene sheet (plastic lid from a margarine container or similar will do) and trim it to shape after it has definitely taken. Kevin. because I use flex track & remove some sleepers due to the curvature, I then remove part of the sleeper that is under the rail so that it does not interfere with insulated joiners - basically the concept that Trevor talks about in his first paragraph. Latest update - all soldering of drop wires (common and live) complete as are the turnout frog 'livening' wires. 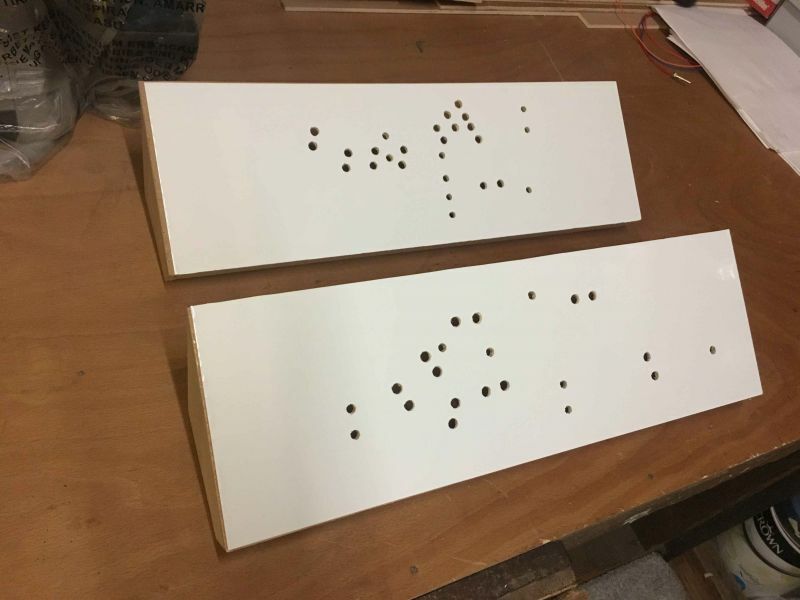 Also complete are the holes drilled for all point switching ready to receive the SEEP point motor operating rods - currently looks like red, black and green spaghetti under the modules but overall very happy how its all turning out. Have also fully tested all the operating modes (isolating areas, mimicking the block sections being powered on / off manually) with two locos and I cannot find any dead track areas or issues ... so even more happy about that - especially as it means I fully understood all the instruction and diagram help Trevor provided. 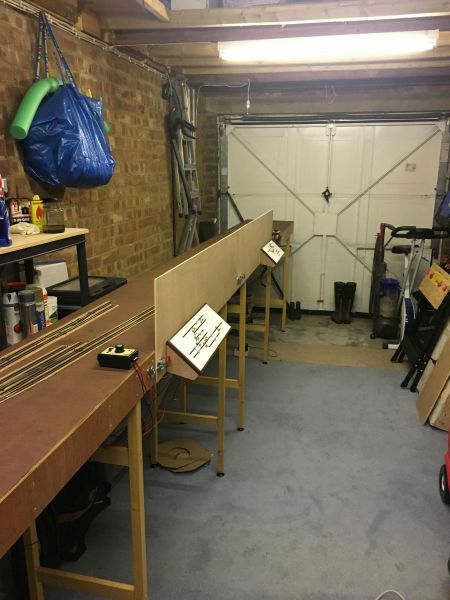 Next step is finally to tack down the track to the baseboards so everything is fully solid and firm - then I will disconnect a module at a time and work on it on its side at a nice height on the workbench to fit and solder all the SEEP point motors. I've also created 'under side' layout plans of the wiring so far with numbering for all the droppers and frog livening wires - I'll place small number stickers to the underside as reference for anybody else to understand what each wire provides to the layout and where it is located (especially as when the ballast is finally in place and the wire connections to the track are hidden) - done with my son and grandson in mind for the future when they inherit the layout and I'm no longer around. At the same time I'm diagramming the Controllers (CAB Control) wiring for blocks based on an earlier example I interpreted from Trevor's hints once again, only this time its for the whole layout as one. I have attached this below as I have perhaps a silly question if one of you can help. BTW ... its not fully complete yet. Black Wire = common feeding both Controllers. Red Wire = live feed from Controller 1 (shown in image) to block switch. 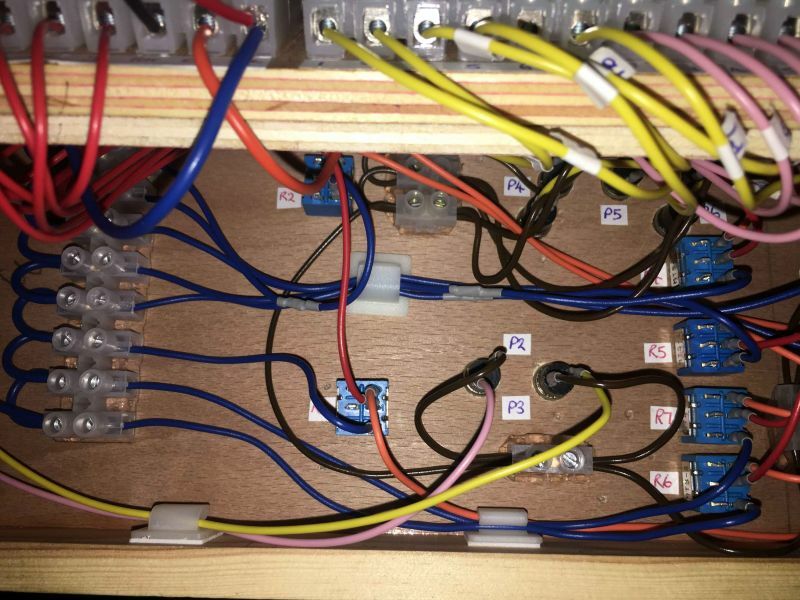 Blue Wire = live feed from Controller 2 (out of shot at the other end of the layout) to block switch. Green Wire = live feed from block switch to track section. 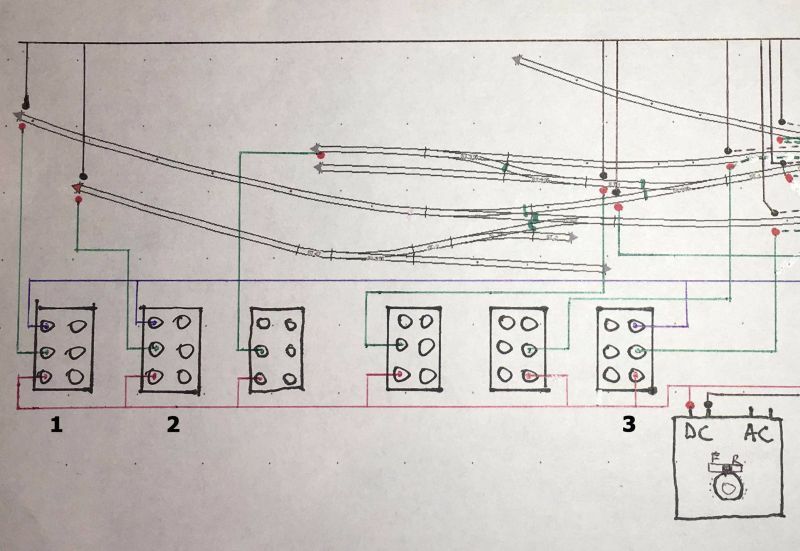 Question:- there is only an operational desire for Controller 2 (blue wire) to be able to power / move a train to certain parts of this end of the layout (West station) so I have only indicated it be connected to certain block switches, namely 1,2 & 3. I can see no reason why this should not be done from an electrical perspective, other than perhaps requiring single on/off switches for these - is that correct? Theoretically there is no problem with what you envisage doing and it will be easy enough with centre off switches. You will not have an issue with using the same switches throughout so no need for a separate On/Off switch. I can see where you would have local control for the yard at the West and East Ends of your layout and there is no problem with that, my issue is with flexibility for later on where one operator can play the shunter while the other drives from either end of the layout or where there are two trains at one end. Using the West Station as the benchmark, are East bound goods trains made up and dispatched on the main line passing siding or in the goods yard sidings? For the East Station, will Goods trains pull in then back up into the yard which faces "further east"? In either case that train will then need to be taken over by the appropriate station throttle before it can do anything else which may be as you want it. For the want of a few inches of wire, that flexibility will be markedly improved to my way of thinking. As you would know, my throttles are home made and I have had issues mainly with the walkaround version from time to time with the portability and the inherent ability to drop it causing an internal malfuction. At least I have been able to continue operating with a contingency plan with the other two while undertaking repairs or locating parts etc. By isolating some sections to one controller, you would be cutting out that aspect of your operation in the event of a similar problem, as rare as that may be. But it is your railway and you need to do as you see fit - and in any case good luck with it. As an aside, I will be indisposed for a few days at least with surgery tomorrow so dependng on when you reply, you might not receive a reply for a while. But I am looking forward to seeing the progress when things improve! hi Trevor ... thanks for the considerations and rationale. 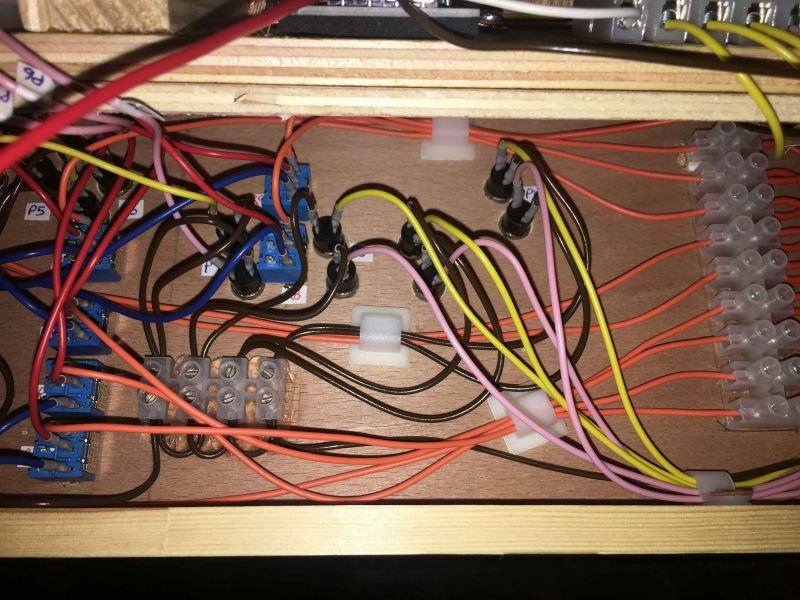 TBH you are right, for the sake of some extra wire and soldering on switches there is more flexibility and operator control to be gained in wiring up both controllers to all block switches so that is what is now on the electrical plan. Have just completed some more testing of track connections and switch / point simulations and I still can't break anything so I consider it to be as sound as I can make it - if something does crop up once the track is fixed I'll just have to fix it. Plan is to start fixing the track as described in previous post over the weekend, taking my time. I hope the surgery is not too serious and of the more minor type - hope all goes smoothly and wish you a fast recovery back to normal. I have now fully tested full operation of the whole layout (all 4 modules connected, control panels connected) with 3 trains (2 shunters and a DMU) in the intended mode of operation ... any everything works perfectly, including all the power isolation blocks and CAB control (2 controllers able to operate the shunters and DMU for the whole length of the layout as required). I did take my time and made detailed diagrams as I went and tested each step of the way - there were not too many teething troubles at all really but this was in the main thanks to the great advice and electrical diagrams provided by Trevor and also advice from Ron .... can't thank you guys enough. So, I now have 2 modules fitted with my desired scenic back board size and the control panels mounted .. the last two modules I'll b]make a start on the same this week. 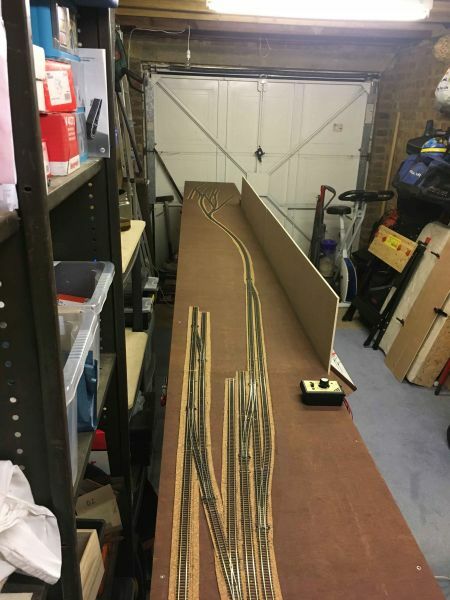 After that, its ballast time and then fitting the platforms at both Braughing and Standon ends of the layout ... then an orderly plan to tackle all the scenics and station. buildings, etc ,etc. Its going to be a busy Spring !! 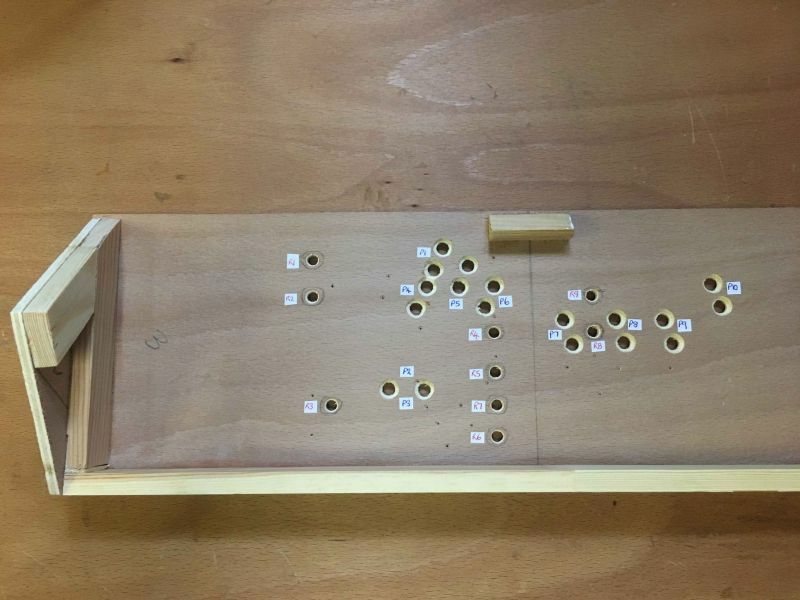 Control panel construction - holes for point switches (smaller ones) and power isolation switches (larger ones) marked, drilled and counter sunk. 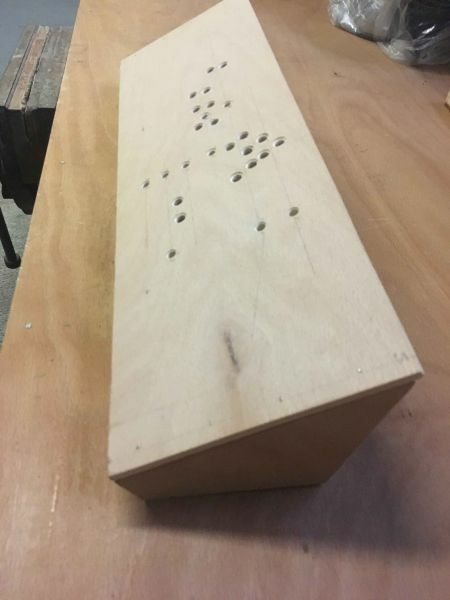 Side view of the construction - mostly all in 6mm plywood with some 18mm soft wood . Covered with white sticky-back plastic for easy wiping of dust and dirt, plus smart appearance. 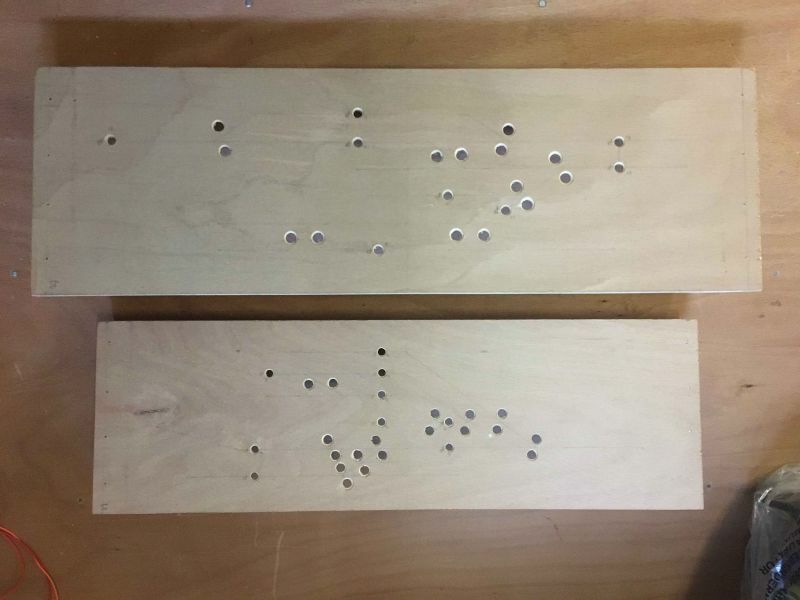 Holes cut out steadily with a very sharp craft knife. The finished items - black nobo-board sticky lining, cut and shaped, used to indicate the main layout. 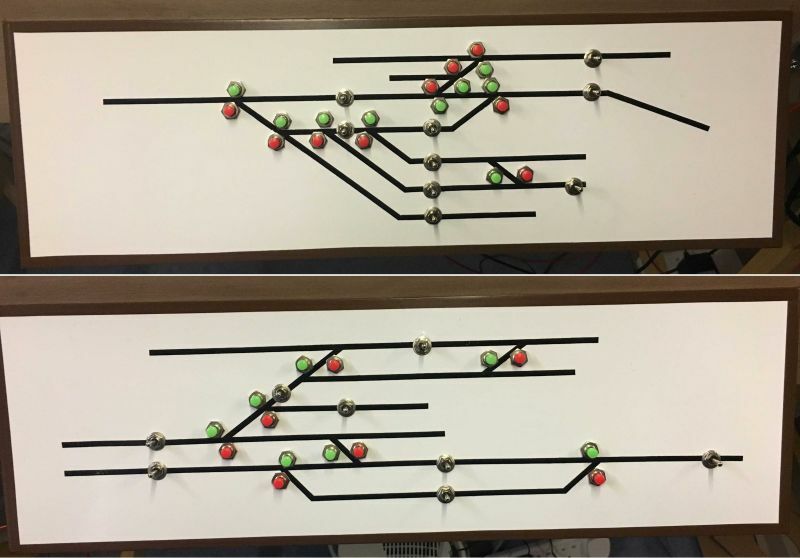 Push to Make switches used for all points (green for the main branch & siding loops, red for the small sidings / head shunts), DPDT mini toggle switches used for the power isolating blocks which also allows CAB control, edges lined with brown electrical tape (very sticky) for a neat finish. Standon control panel on top, Braughing control panel below. Underside of control panel - again trying to keep everything neat, labelled and easy to access for wiring issues or swap out any faulty switches. Another view of a control panel underside. Very neat work under the panel there Paul. In fact, all your electrical work is well planned, which makes the execution so much easier. A pretty layout, my partners Grandfather was the crossing keeper at West Mill for some years after he was injured in an accident at Stratford Works. The Buntingford society has a nice layout of Buntingford Station in N Gauge which goes out to West Mill. 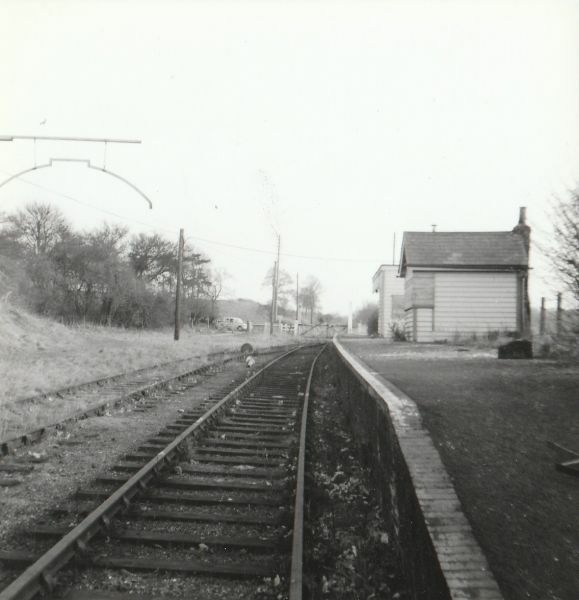 My late Father in Law took this some time after the end of the freight service in 1965. Hi Simon and many thanks for the feedback and the photo of Westmill. Your comments are more accurate than perhaps you realise - I am a member of the Buntingford Railway & Historical Society and know the N gauge layout you spoke of quite well. It was this layout that inspired my own, where the thinking behind it was to continue the with the next two stations on the branch line after Westmill - namely Braughing and then Standon. In fact, I also maintain and populate the society's Buntingford website and scan / post all the photos too - if you have not seen the website take a look http://www.thebunt.co.uk/index.html and check out the 'gallery' & 'now & then' sections where there are many more photos of Westmill. Very interesting to hear that you have a direct connection to Westmill via your late father-in-law and partners Grandfather. I'd also be very interested to hear of any other photos or memorabilia your family may still possess of Westmill that we could share on the website, with permission of course - I'll send you my email address via a PM so we can converse a little more on the topic.